The theme for July's Verve Project Parade is "Divine Details". Each Verve Diva posted a project, then described her creative process. It was fun to see how their cards and projects evolve! I don't think my personal creative process is anything earth-shattering, but you may find it interesting (maybe?). I usually start by deciding what my main image (or sentiment) I plan to use, then I look for a sketch or blueprint for my layout. Alternatively, I may start with a sketch, then look for an appropriate image. In this case, I chose my sketch (SC239), then my stamp set (Forever In Our Hearts). If the image can be colored, I usually pull out my Copic markers. Next, I will go through cardstock and patterned paper to get color ideas. The selection process can take me quite awhile. Once those are chosen, I pull out coordinating embellishments (ribbon, brads, rhinestones, buttons, etc.). I may not use them all, but I like to have them spread out on my table so I can see what I have to work with. I typically use a lot of layers in my cards, but lately I've tried to expand my designs to include some clean and simple cards. In this particular card, I tried to keep it clean and simple and to use True Black as my main color. I added Spring Moss (primarily because I just got this wonderful faux suede ruffled ribbon from Jody! - She's out of stock of this particular type right now, but she has a lot of other great styles!). I usually cut my panels out, play around with them and decide on the placement of everything before I glue things down. I like to use Nestabilities to cut out my images whenever possible. It just makes layering and matting so much easier. This card came together pretty quickly, which is not always the case! I finished off my panels with piercing. After adhering the 2 vertical panels, I added foam tape to my image to make it "pop". I knew that I wanted a simple sentiment that would fit in the lower right-hand corner and this one from Heartfelt Phrases was exactly what I was looking for. Finally, I added 3 tiny pearls above my image panel. If you're still with me, thanks for following along! I will have 2 posts tomorrow... I hope you have a wonderful weekend! Thanks for stopping by! Accessories: Rectangle Nestabilities (Spellbinders), Cuttlebug (Provo Craft), Pearls (Kaisercraft), Ribbon (confessionsofaribbonaddict.blogspot.com), Paper Piercer, Bow Easy, Foam Tape. 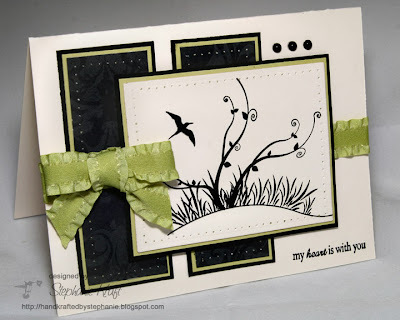 Beautiful card Steph :) Thanks for sharing the process! So pretty! I pretty much do what you do, lol. Though I have a hard time actually following the sketch like I'm suppose to. I love the black and green! This is so beautiful. What a perfect sympathy card. I just love the clean, simple layout and layering that you used. Right up my alley! What a gorgeous CAS card! I love the paper piercing and that ribbon is just yummy!! gorgeous card, Stephanie! I love that green ribbon. Clean & Simple is SO fun!! So beautiful, Stephanie. Thanks for sharing your divine details. Wow Steph, this card is stunning! I love it! Such a beautiful card, Steph! Love the ribbon and reading a little about your process. Thanks for playing along in our parade!